Labor Of Love: The Art Of Holding Questions!! Last year November we hosted half a day gathering to dive deeper to explore idea of labor of love and understand the many nuances of sustaining it. The intention of this gathering was to really listen to inspiring stories, help each other identify multiple forms of capitals and intelligences that could be hiding in plain sight and build friendships to support each other’s intentions well beyond the gathering. At Servicespace we have always talk about the spectrum and diversity and therefore by nature’s way of designing we had a diverse group come together. The idea was to really hold space for the stories that were to emerge and look at the fruition of such holding. The gathering brought together a diverse group of volunteers and entrepreneurs working on a variety of ideas – from an IITian who decides to give up a lucrative career to a life of self-restraint and spiritual study, young fashion designers going against the current and promoting slow design, college student redefining politics for young students, University profession working on projects that enable transformation in students and many more. The retreat had actually started some weeks before the gathering actually began. There were many mini circles with participants to delve deeper into the concepts of multiple forms of capital, understanding creative constraints, impact vs transformation based work, why values are important. Participants worked on some questions shared below around their projects for their final presentations. About your project: What inspired you to start it? What is your core intention? How do you envision it will serve society? About your process: How do you think (inner and outer) transformation happens? What is your theory of change? What creative constraints have you embraced along the way? About your learnings: What are some of the edges/challenges you've faced? What has been the most striking (internal or external) breakthrough in your project? What enabled that breakthrough? About your vision: What is an unresolved question that you are currently holding? What is the next breakthrough you aspire to? Vinoba Ashram very graciously offered space for the gathering. Jagdish dada who started the Ashram and his family over the years have served hundreds of people. Their lives have been great pointers to a life of service and transformation. And, it was an honor for us to come together in the spirit of service and generosity in that space. The gathering began with a prayer followed by presentations from the participants. Parth is 21 years old, he is a thalassemia major and is not sure how long is he going to make it. But that does not stop him from doing anything he loves. Generally in India thalassemia patients are treated like a burden on the family, especially those who cannot afford bi-monthly blood transfusions and other medical expenses of the child till s/he lives. In that case, any wish that a child has is always an extra burden. Looking at this Parth and some his friends started "The Wishing Factory” in 2015 to fulfil the wishes of children who have to visit the hospital every 15 days to survive the next 15 days. For this group of friends no wish looked impossible, they worked tirelessly to bring a smile to the faces of those children. Looking at Parth you know he is living in the moment, embracing the present graciously and living in great acceptance of the impermanent nature of life. Parth understood that consistency was important for his work to go deep and within the same context he was holding the question - how do we sustain the interest of volunteer for a longer period of time? How can the volunteers be intrinsically motivated to go on? Anshu faces questions around the human nature. He shares an interesting example around how when in need of blood for a dear one, people would call him frantically and tell him that it was an emergency and a priority issue and to help arrange blood. This amazes Anshu as these people do not think of it as an emergency when it is not them facing it and hence do not think much about donating blood themselves! Medha is a fashion designer who is working to serve two extreme ends of the spectrum. Medha hails from a family rooted in the values of non-violence and sarvodaya (upliftment of all masses). Having seen her parents work for farmers’ welfare and advocate organic farming to ensure sustainable agriculture, seed sovereignty, she was always aware of the lives of small, marginal farmer. Through her project Weaver Bird she helped organic cotton farmers get a premium of upto 30% for their produce. She then works with traditional cotton spinners and traditional yarn makers, uses natural and organic dyes and provides aesthetically designed organic cotton fabric for the end-user. Medha thereby is assisting the farmers to move from chemical to organic farming, providing employment to traditional processors and artisans and is somewhere strengthening the roots of Indian culture and heritage. Medha is faced with the challenge of changing consumer mindset and behaviour towards a more organic lifestyle. How feasible and practical is it to produce consciously at each stage of production? How do we keep up with practicing the value of ‘truth’ in everyday life and dealings? Ankita is also a creative entrepreneur who is working on the idea of ‘slow fashion’. In a time when wardrobes are changing every season, Ankita is swimming against the tide by telling people to use and re-use a piece of cloth like we did in olden times. She is asking pertinent questions and is intending to spark a conversation with designers, retailers, manufacturers, and others about how their actions can have a greater impact. She is the creative director of Swavlambi where she works with urban women. In Swavlambi craft is a medium to share many messages and transform lives of women engaged in the craft and people who use the craft. Ankita's questions revolve around how viable is ‘slow fashion’ from a business point of view? What would be kind of profit we would look at in that case. Kunal is a young student who has been working passionately to get more youth interested in the politics and understand it. Today in Gujarat most young people will be unaware of the local political system and the elected representatives in their areas. The general trend is to look at politics as ‘dirty’, ‘not my cup of tea’, ‘wastage of time and energy’ etc. 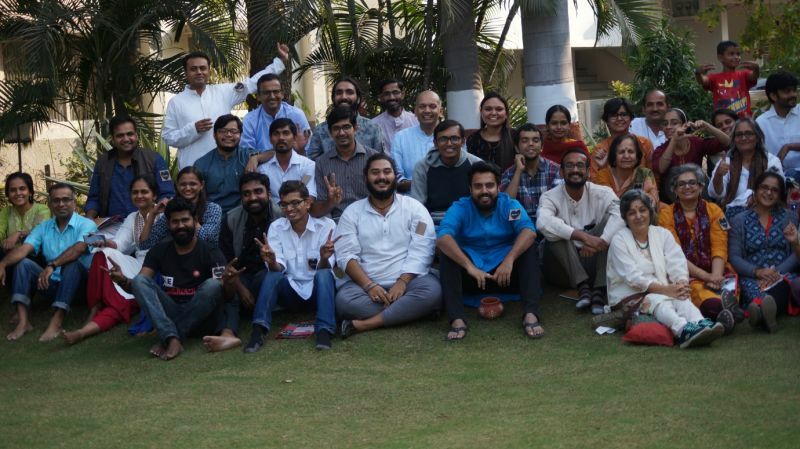 Kunal founded Gujarat Chatra Sansad three years ago where they are creating spaces for young people to be aware of the political systems and also creating spaces for them to have a voice, participate and raise questions without being a part of the political system. Kunal feels that Chatra Sansad is still in its infancy and they are still in the process of co-creating their vision and finding their core values. He understands that this is most crucial for future long-term work. He is holding many questions as they are giving shape to this dream. Ritesh is a volunteer at Kolisetu an all-volunteer run non-profit started by Koli community youth to support young people coming from Saurashtra to the city. The online platform is striving to act as a connector that allows the people to seek and offer help to each other in whichever small way possible. It recognizes the existence of, and tries to make use of, multiple forms of capital through this many to many interconnections. Ritesh shared that with the help of the website, students who are going to other cities for studies are able to seek and get help with boarding, lodging. Similarly, there have been community members who travel for medical reasons to a bigger city and the website has acted as a conduit in helping them with information as well as assistance in the new city. The core idea of the project is to create a support system for community weaving love and togetherness. Ritesh is holding space to see that how the initiative moves from helping to serving in a deeper inner transformation way. Rachana is a professor of Human Development and Family Studies and a volunteer at heart who is asking many interesting questions to her students and is holding space for transformation at many fronts. She shared her journey from attending an Awakin circle for three years to now hosting one and how that has transformed her in many ways. Rachana is now trying to bring this element of transformative organising in her workplace. Her core intention is creating a stress-free environment for self and her students, engaging with the "why", focusing on the big picture while taking small steps and all this while keeping empathy at the core. Rachana's husband Ashish is also taking his journey to a different level by applying love, kindness and compassion with the clients and vendors each time an opportunity presents itself. Rachana is holding systems questions about how can those changes happen as we focus on the small? Siddharth is a pass out of IIT Mumbai and decides to walk out of a lucrative career option and chooses to life quiet opposite to the mainstream flow. He spent a year in a village in Rajasthan working with schools empowering teachers and later spent another year at a Vipassana center. He does bare minimum work for sustenance and spends rest of the time in cultivating meditative practices in daily life. Siddharth is holding questions about the dynamics of harmony and the mechanics of ‘Doing, but not Doing’. Sandeep and Vivek who are both volunteers at Samvad which is a youth initiative of Olakh. Their intention is to host a series of dialogues with inspiring people who are transforming their vision into reality. The idea is for young people to come and engage in a dialogue and to expand their world views. In the after-hours, the entrepreneurs opened their pots. There were smiles everywhere of feeling so deeply supported. “Always there, ask” someone offered to a project. “I can offer my time to hold circles in your organization.” “Call me for anything you need in life.” Everything was offered like you would in a monk's bowl -- no strings attached. Laced in one-way-love. Next up Nipun shared whether it is a small act of kindness or something matures into a virtuous cycle of consistent offerings, the underlying principle is to tap into multiple forms of capitals and intelligences, build a resilient field of noble friendships, and increase the circulation of "priceless" in our communities. All too often, "labor of money" ends up overtaking our deeply held intentions of love. We, as a circle, hope to provide a backbone of unconditional support to keep that flame of compassion alive, as we brainstorm new ideas and deepen existing practices for the greater good. Nipun shared 5 insights about labour of love volunteerism and shared many stories that have emerged from the eco-system through collective wisdom on practices that support labor of love projects. Volunteerism is not a means to an end. It is the end itself and volunteers are rewarded by inner transformation and the deep ties that form. Transformative volunteerism is generative, it grows naturally and organically. The stronger the skilfulness in leveraging multiple forms of capital, the strong the ladder. Volunteers thrive in the spirit of experimentation. Volunteers innovate because the cost of failure is practically zero. When you do labour of love work, the reward is the love part of it. “With years passing by I am able to see the complexity in our lives. There is so much to see, so much to hear and understand, so much to do. And an opportunity to sit in sacred circles like this, listen to each other and to the whisper of the inner voice and move toward co- creating a beautiful world. All that happened and left a deep mark on the soil of my heart. It was so wonderful that first you all volunteers gifted 'Seeds of Change' and next day you helped us till the soil, then helped us sow the seeds and now showing making available a wellspring of fresh water to take care of our saplings! All in all it was a day of finding a treasure of uncountable a blessings. “To me, two points from the entire retreat stood out. One was about "Volunteering is an end in itself and not a means to an end", which struck deeply. So volunteering to me was an activity without much awareness as to the power it holds, but this statement made me think differently about the entire concept and has now forced me to look at volunteering in a different hue. Volunteerism as a means to achieve inner transformation was something that I had heard about but not thought much about. This statement on volunteerism was profound! In the spirit of being the change we wish to see in the world, we choose to lead with love and inner transformation. We can all give, create, care. There is always enough to regenerate love in the world. So wonderful to be reminded of this beautiful day together! ...the message in the last paragraph, “We can all give, love, create. There is always enough to regenerate love in the world.” ... beautiful and encouraging!